This code uses the standard formula to obtain the period of a frequency; the period is the duration of a single cycle in a repeating event and is the reciprocal of the frequency. You specify the frequency of your alarm tone in Hertz (Hz) and assign it to the float variable alarmFrequency. Your alarm will alternate between playing a tone at this frequency. Two long integers, beepDuration and elapsedTime, store the elapsed time the tone has been playing and the duration that you want it to play. The while loop uses these to limit the time the note is played to 0.25 seconds (beepduration). Whew. That was a lot of code; but now the clock is ready to have its trial run. 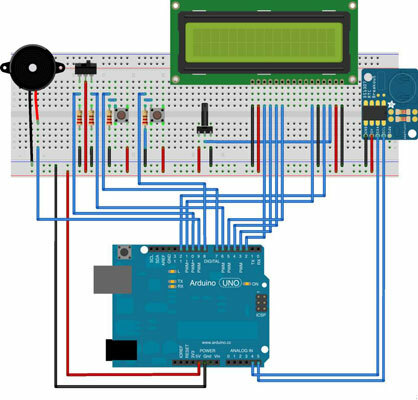 In the code, set the alarm time to be something in the next minute or so; then in code and send the code to the Arduino. Make sure the slide switch is in the armed position and that your asterisk is displayed. Pretty soon, you should have your rewarding alarm. If you have any trouble, check your connections. Then check your code to make sure it’s correct. Beep! Beep!! Beep!!! 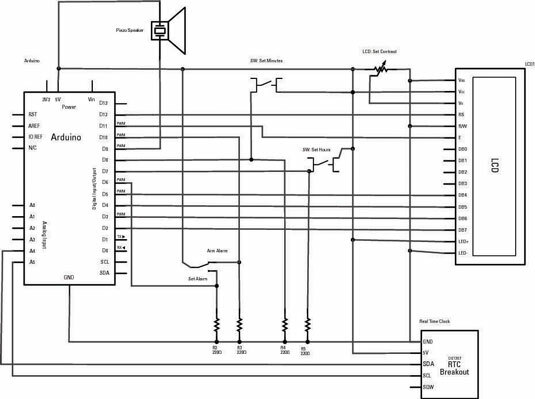 It’s time to pat yourself on the back for building a fully functional alarm clock from scratch!